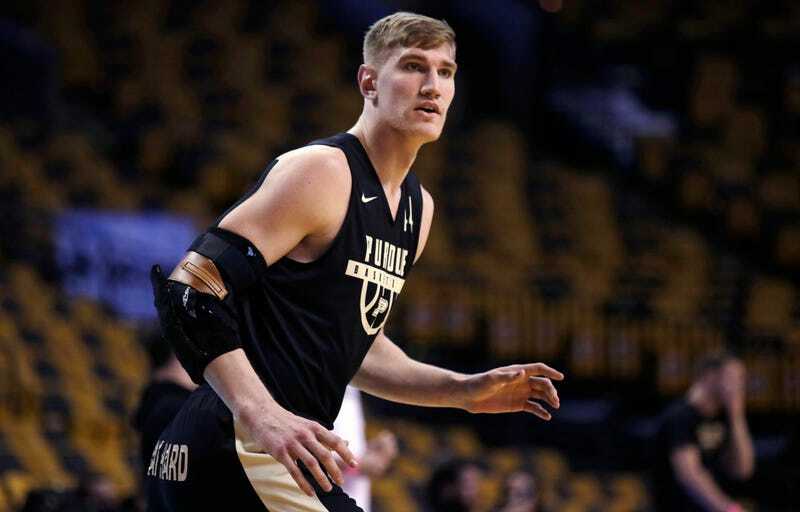 Last weekend, it was reported that Purdue center Isaac Haas had a broken elbow and would miss the remainder of the tournament. Then, just two days later, reports started trickling out that Haas was trying to play. Then, video appeared of Haas clearly in pain as he failed to lift the ball above his head for more than half a second, and the reports were snuffed out. A sensible person would think that’s the end of it, but college sports does not abound with sensible people. Amazingly, even after similar videos made their rounds, the question of “Will Haas play?” is still being asked. In Purdue head coach Matt Painter’s Q&A session on Thursday, the inquiry was the very first one asked and was followed up with another about how difficult it is as a coach to bench an injured senior just two games into their final NCAA tournament. His response was honest, and it all but certainly underlined and bolded his statement from last weekend that Haas was likely shut down for good. Yeah, he didn’t practice the last two days. So I don’t see him playing. Until he can practice and show me he can shoot a right-handed free-throw and get a rebound with two hands. In the last two days he hasn’t practiced. So I don’t see it. In this situation, like if Isaac could do it, if it was on his non-shooting hand, maybe you could think some things through, if you could still make a free throw, he could still go to his jump hook, which is his best move. Now with this, he can’t go to his best move. Can he catch the basketball? Can he make a free throw? Can he get a two-handed rebound? Those answers have been no from what I’ve seen. And the last couple of days of practice, he hasn’t practiced or tried to do it, it just kind of sends the same thing. We have the best brace we possibly could have. That’s going to be the best. Now if some other brace gets cleared, it’s not going to be quite as good, but he couldn’t do those things with the best brace. So it’s very difficult in those situations, but you also have to be a truth teller. Please, for the sake of my emotions, and for the sake of the nerds at Purdue who think they will somehow zap the pain from his fractured elbow with a new brace, let this be the last time this question is asked. Report: Isaac Haas Still Alive, Thanks To Modern Science?